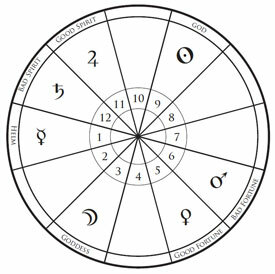 The planetary joys scheme is an arrangement which assigns each of the seven classical planets to one of the twelve houses. The joys were used in the Hellenistic and Medieval astrological traditions, although they fell into obscurity in the modern period. Mercury has its joy in the 1st house. Moon has her joy in the 3rd house. Venus has her joy in the 5th house. Mars has his joy in the 6th house. Sun has its joy in the 9th house. Jupiter has its joy in the 11th house. Saturn has its joy in the 12th house. When a planet is in the house of its joy it is said to “rejoice”. The joys appear to be partially based on the notion of an affinity between each of the planets and the specific house that it was assigned to. Modern astrologers usually favor the assignment of planets to houses via the rulership of the signs (e.g. Aries = 1st house, Taurus = 2nd house, etc. ), although traditional astrologers instead appear to have used the joys in order to derive some of the significations of the houses. In 2013 Chris Brennan published a paper demonstrating that the planetary joys acted as the motivation for the assignment of the four classical elements to the signs of the zodaic, as well as the rationale for the significations of some of the houses. 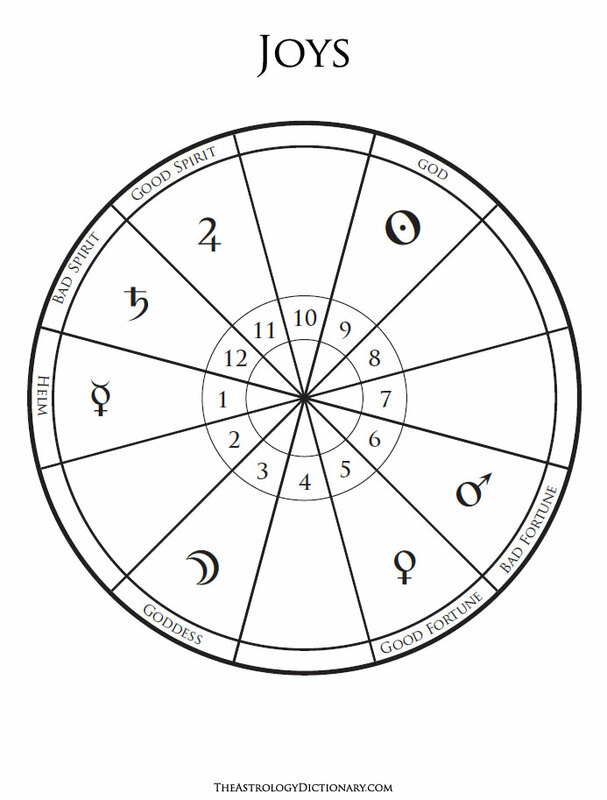 He argued that the joys acted as a theoretical construct that was used for generating basic techniques and principles in early Hellenistic astrology, similar to the role that the Thema Mundi played. See Chris Brennan, “The Planetary Joys and the Origins of the Significations of the Houses and Triplicities,” originally published in the International Society for Astrological Research Journal, Vol. 42, No. 1, April 2013.